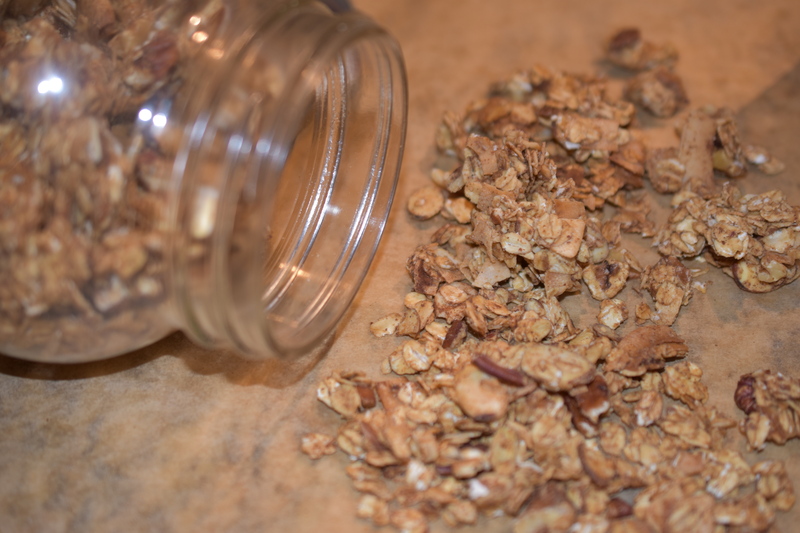 I made this granola because I was wanting something with a little sweet, but also some crunch. It smells really good in the house when you bake this in the oven. The granola has a touch of cinnamon, nutmeg and vanilla. This granola is great for breakfast, a snack and just because. I love having a healthy and nutritious snack around the house. Preheat oven to 250 degrees. Line sheet pan with parchment paper. Combine all dry ingredients and stir. Combine wet ingredients into a glass measuring cup. Microwave mixture for about 30 seconds to melt almond butter. Pour almond butter mixture over dry ingredients and stir thoroughly. Bake in oven for 2 hours. Turn oven off and leave in oven until granola is set. Break up into pieces. I love homemade granola but have never made it with almond butter. It looks delicious! Thanks Rachel. the almond butter adds a little more protein and is a healthy fat.